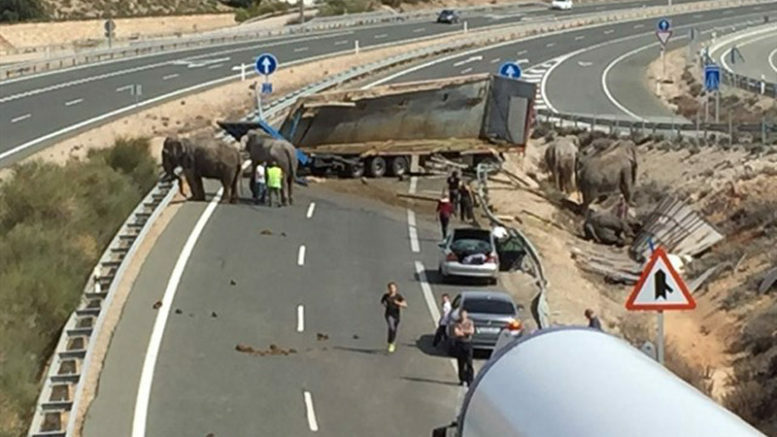 InfoCircos, a coalition of organizations working to stop the use of wild animals in circuses in Spain and across Europe, is going to the European Commission to urge a definitive EU-wide ban on the practice, following a highway accident near Albacete last week in which an elephant belonging to Circo Gottani was killed and four others injured. According to InfoCircos, the organization will present the European Commission with more than 180,000 signatures gathered online in less than a week in support of the ban on the use of wild animals in circus acts. InfoCircos, an umbrella campaign backed by Barcelona-based FAADA and Anima Naturalis, Madrid-based ANDA, UK-based Born Free and Netherlands-based AAP Primadomus, has been instrumental in convincing 470 municipalities, including several of Spain’s largest cities, to ban the use of animals in circus acts. Since 2015, several autonomous regions in Spain have likewise moved to stop the use of animals, including Catalonia, the Balearic Islands, Galicia and Murcia. But there are still 11 Spanish cities of more than 100,000 inhabitants that continue to allow circus performances using wild animals, according to InfoCircos spokesperson Marta Merchán, even though she says “veterinary science has shown that it is impossible to protect animals living in these conditions or to ensure public safety”. In presenting the petition signatures to the European Commission, InfoCircos will be asking for the establishment of a legislative road-map taking into account the welfare and health of the animals as well as citizen safety in order to establish a Europe-wide prohibition of the use and transportation of animals across Europe by circuses for the purpose of providing human entertainment.